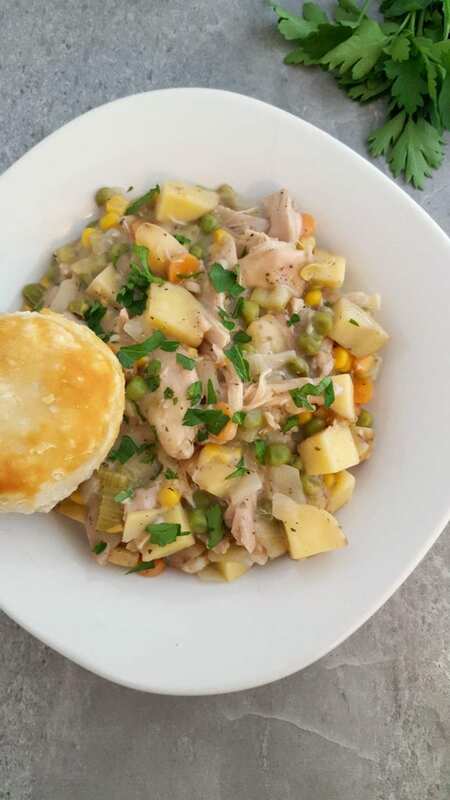 Make an easy Chicken Pot Pie in the slow cooker to make dinner a breeze. I'm so deprived in the world of Chicken Pot Pie. My husband doesn't like peas so we don't eat it in my house. Making a whole IPA and leaving someone out doesn't work in our house. We teach trying new things and eating the meal we are given since he doesn't do that, I just don't make certain things. Now if it's a weekend or during the week at lunchtime, that's a whole other scenario. That means I get to make whatever I want for myself and the kids without the fight. 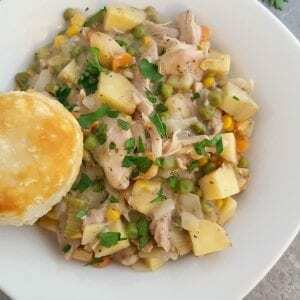 So this Crock Pot Chicken Pot Pie is a great way for me to do that. I can make it and serve to the kids or eat it for my lunch during the day. I love easy crock pot recipes because they make for easy meal planning. 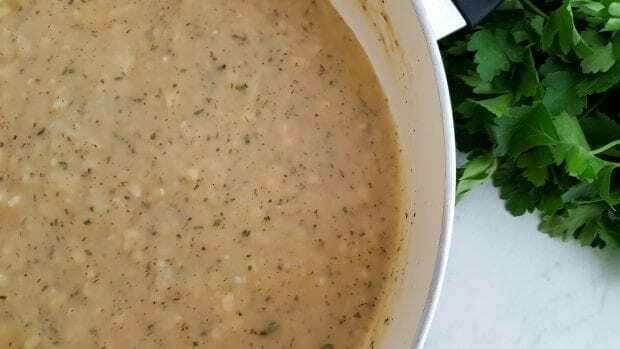 I rely on slow cooker and Instant Pot recipes to get me through the busy, chaotic week of being a taxi. If I don't we end up going through a drive-through or going out to eat and that gets expensive. The newer Instant Pot's also have a low cooker option which makes it the best small appliance by far. I love how loaded with vegetables this recipe is too. Big beautiful colors. I love easy recipes! To prepare sauce, melt butter in a large saucepan over medium heat. Add the garlic, stir and cook until fragrant, about 1 minute. Whisk in flour and cook for 1 to 2 minutes. Slowly whisk in chicken stock, thyme, basil, and paprika. Continue whisking until the sauce begins to thicken, approximately 5 minutes. Taste and add desired amount of salt and pepper. Spray the inside of slow cooker with non-stick cooking spray. Season chicken thighs with salt and pepper, and place in a single layer in the bottom of the prepared slow cooker. 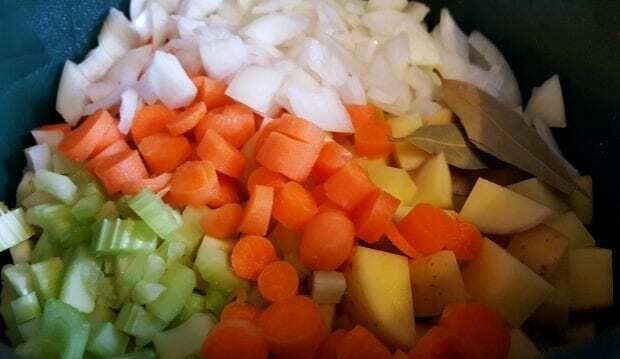 Add potatoes, onion, carrot and celery. Stir in chicken stock mixture and bay leaves. Cover with lid and continue cooking for 3-4 hours on high heat, or 6-8 hours on low heat. In the last 30 minutes of cooking: remove the chicken thighs from the slow cooker and shred before returning to the crock pot. Add corn and peas to the crock pot, stirring once. Cover and cook for an additional 30 minutes. Also, this is the time to bake your biscuits as stated on the packaging (or use homemade if you prefer). Remove the bay leaves. Serve in bowls with fresh parsley sprinkled on top. 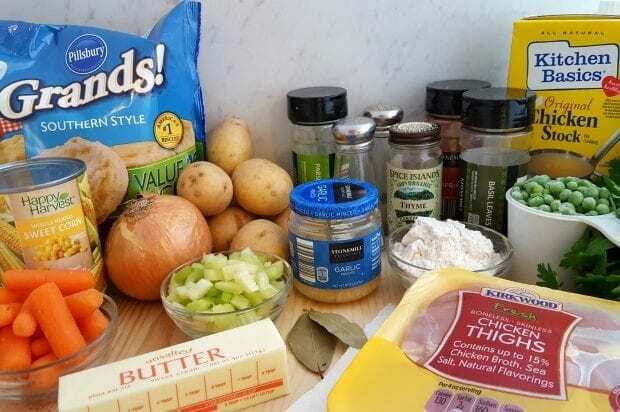 *Pour the chicken pot pie mixture over a freshly baked open-faced biscuit or serve the biscuits on the side to be used to scoop up the mixture. Love this recipe! Very easy, cooks well over a long period of time. I was studying (aka cramming!) for finals all day and needed something I could fix in the morning for dinner. I didn’t have cream of chicken on hand so I used cream of mushroom instead with a full can of milk, no water, plus added a tbsp sour cream for a slightly tart flavor (my mom did this for her chicken pot pie filling). I added 1/4 cup white rice flour (gluten free family) to help thicken it even more. 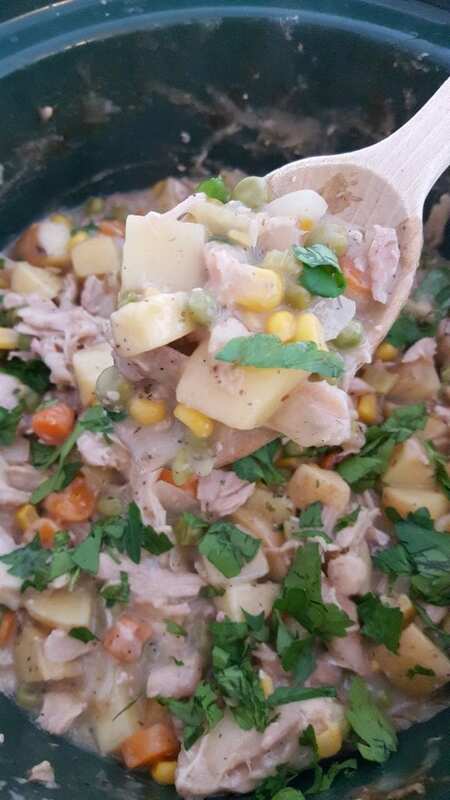 I used fresh veggies (potatoes, carrots, celery, onion) and they got so soft and flavorful that my husband ate them right up (he’s a meat and potato guy). I made gluten free bisquits on the side. Amazing combo! Thanks for the idea ? I am terrible with gluten free pie crust but missed that home cooked soul food meal, and this was just as satisfying.